Repeatedly! So often in fact that I have a top three favourite bathrooms, none of which was the old bathroom. Hey don’t judge me, you didn’t see how ugly it was! So in light of the upcoming bathroom reveal I thought I would post my three favourite bathrooms and see which one you like best. I love how shabby this is! It feels very “I Capture The Castle” to me. I can just imagine Topaz twirling around that room. This one is just so light. I have to have lots of light in a room. Beamy cottages are very cute, but I could not live in one. This one is just perfect right down to the antique scales. 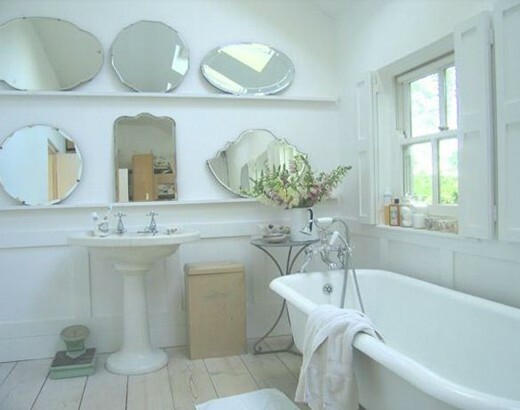 I’m thinking about doing a similar mirror idea in our bathroom, but I haven’t quite decided yet. What do you think? Definitely the 2nd one. It’s so perfectly bright and friendly! It’s very inviting isn’t it! Bathroom three! I love the idea of having shutters. The second one is beautiful, but I agree shutters are a win! I think I’m starting to get a shutter addiction! 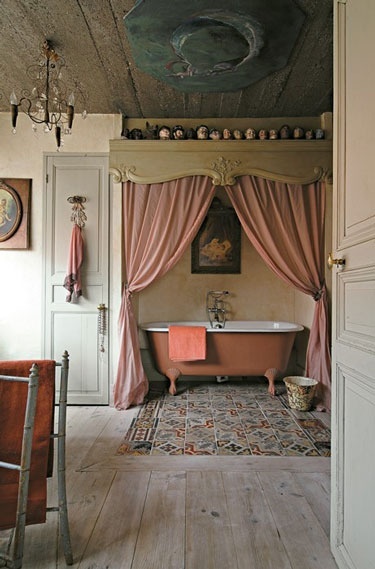 Oh my lord – this is one bathroom I won’t be impersonating but I do love it. Very chic. If rather over the top!